Midwest Machinery is located just west of the junction of Hwy 210 and Hwy 371 and the Home Depot at 7045 Foley Road, the frontage road adjacent to Highway 210 in Baxter, Minnesota...Gateway to the Lakes Area of Minnesota. 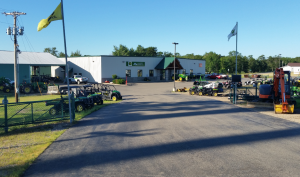 Midwest Machiney's goal is to provide the highest quality products and to be recognized for superior service, by offering products by John Deere, and Stihl You will find what you are looking for at Midwest Machinery. Whether you need equipment for work or play you will find it here at Midwest Machinery of Baxter/Brainerd, Minnesota. We invite you can take a ''Virtual Visit'' to our store by clicking on any of the icons on the left side of any page. Enjoy!